Note: You must sign in to purchase HMNS Catalysts members tickets. From a huge blue topaz crystal weighing more than 2,000 carats to a crystallized gold cluster that is one of the most highly coveted objects in the mineral kingdom, the spectacular specimens on display here are true masterpieces – the Rembrandts and Picassos of the natural world. 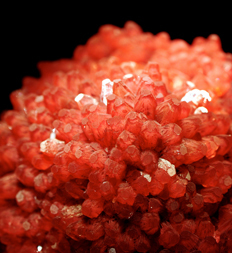 Discover more than 450 beautifully crystallized mineral specimens, including some of the world’s most rare and beautiful examples. Strictly for adults ages 21 and up! Free for HMNS Catalysts Members! *For guest tickets and Museum Members (all other levels), please reserve tickets at the Museum box office or by calling 713-639-4629. 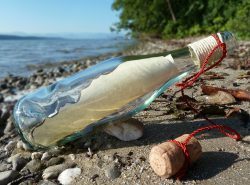 Throughout history, the Message in a Bottle phenomenon makes many appearances; Greek water current studies, Japanese epics, Poe, Dickens, and the rock band, The Police. This exhibit continues the tradition, capturing the zeitgeist of the Message in a Bottle through American eyes. No single artist is featured, but the personal voices of everyday Americans are on display in this rare collection of messages found in bottles along the Mississippi River and other U.S. rivers. Organized by Chad Pregracke, the Living Lands & Waters crew and many volunteers discovered these messages over the past 20 years while carrying out waterway clean-up efforts and education. Established in 1998, Living Lands & Waters is committed to the protection, preservations, and restoration of the natural environment of the nation’s major rivers and their watersheds. Living Lands & Waters crew spend up to 9 months a year living and traveling on a barge, hosting river clean-ups, and other watershed conservation efforts. The messages presented in this exhibit were found in bottles discovered in these efforts. Owned and Curated by Chad Pregracke, Founder & President, Living Lands & Waters. Organized by Chad Pregracke and Message in a Bottle LLC. Local support provided by the John P. McGovern Foundation. Credit cards are now accepted at all of the HMNS Mixers & Elixirs! 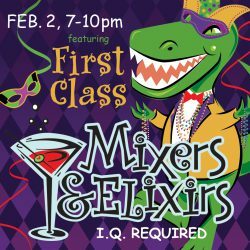 Mixers and Elixirs is for adults 21 and over. Tickets $25, HMNS members $15 and free for HMNS Catalysts. Contact groupsales@hmns.org for group and corporate rates. 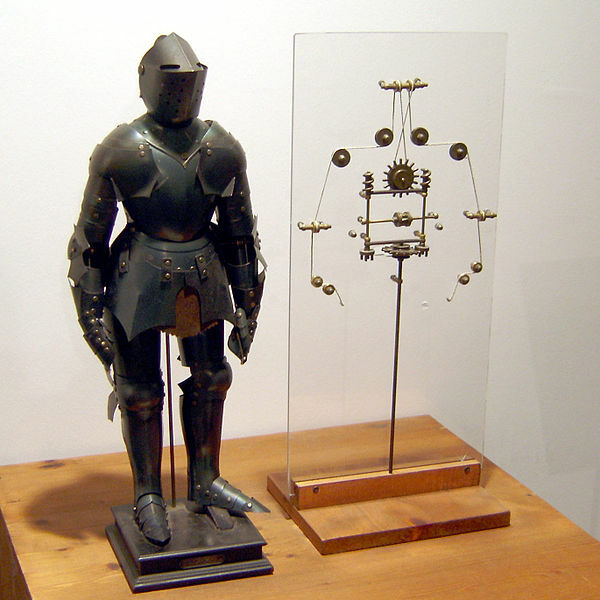 Model of a robot based on drawings by Leonardo da Vinci. Take your simple machines to the next level! In this Maker Lab you’ll investigate simple machines and cams to create a working automaton.